A dangerous and unattended condition caused your injuries – this is generally the easiest part of the case to prove. An obstacle or foreign substance on the floor is generally a dangerous condition. The store knew about or should have known a dangerous condition existed, or was the source of the dangerous condition itself. This condition can be more challenging for many personal injury attorneys – especially if they do not take their cases to trial. 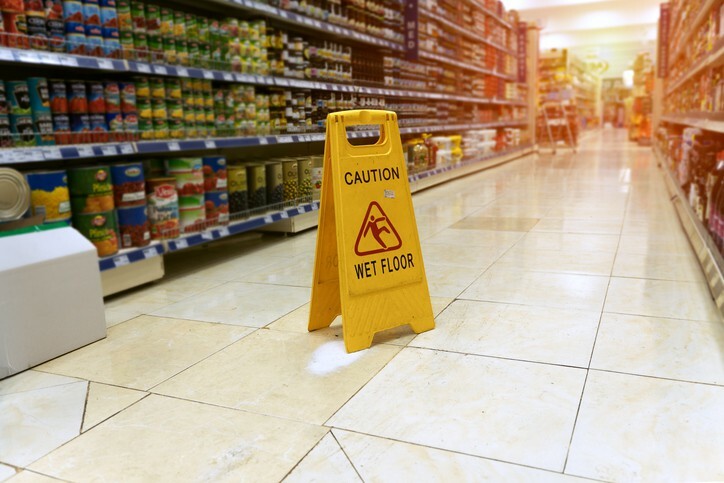 For example, if you are shopping within a grocery store, and you slip on some condiment which fell of the shelf and spilled, can you hold a store responsible for injuries in a slip and fall case? Any spill or substance on the floor of a store is dangerous. The issue is how the substance got onto the floor, how long had it been there and was the store exercising proper care and maintenance? Did someone inadvertently knock a jar of pickles off the shelf just before you came down the aisle? If that were the case the law does not require a store to respond in an immediate time frame and the value of your case may be challenged. However, if the spill had been on the floor for an hour the store’s liability is much greater and a successful verdict or settlement should follow. The store is required to have its employees regularly check the aisles and attend to any spill or other risks. In this case, the store’s employees should have seen the juice from the broken pickle jar and promptly cleaned it up. However, if an employee of the store knocked the pickle jar off the shelf inadvertently a few minutes before your arrival, the store itself is considered to have created the dangerous condition which increases the strength and value of our case. There are many sources of evidence including video as well as maintenance logs. Identifying and preserving this evidence is crucial to hold a store responsible for injuries in a slip and fall case. If you have been injured in a commercial property or store we invite you to contact us or call 949-305-1400 to speak with us personally for a free consultation. Many other personal injury attorneys will not take a slip and fall case. The Law Firm of Rivers Morrell has a strong track record of success in premises liability cases. We welcome your inquiry and will help to determine if you have a viable case.